The present epidemiological investigation was conducted on a total sample of 2067 individuals in the age groups of 5-6, 15-16 and 30-35 years belonging to urban (U) and rural (R) areas of three states of eastern region of India viz. West Bengal (U & Rn = 361 & 359), Orissa (U & Rn = 351 & 351) and Sikkim (U & Rn = 323 & 321). Dental caries recording was done according to WHO index 1983. The point prevalence of dental caries, deft/DMFT and defs among all the three age groups in the urban and rural areas of three states revealed common pattern i.e. (i) Dental caries was higher in 5-6 year old children (U & R - W.B. = 52.4% & 48.3%, Orissa = 56.0% & 48.7% and Sikkim = 61.8% and 22.0% exception) as compared to 15-16 years (U & R.- WB. = 21.0% & 15.2%, Orissa = 18.3% & 19.8%, and Sikkim = 30.1% & 17.9%) and 30-35 year old individuals (U & R WB = 19.4% & 18.1% Orissa = 24.3% & 20.1% and Sikkim 29.9% & 24.5%) in West Bengal, Orissa and Sikkim respectively, (ii) dental caries was higher in urban as compared to rural areas. The decayed (d/D) component contributed maximum to total deft/DMFT and defs/DMFS score, followed by e/M (missing due to caries) and f/F component (filling) which was negligible or absent. Teeth requiring various type of treatment found that one or two surface fillings were maximum followed by others. Fluoride content of drinking water was negligible (0.004 - 0.011 ppm). 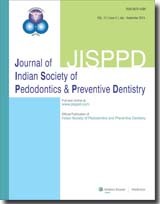 This study was conducted to compare the caries preventive efficacy of Fluoritop - SR; the first fluoride varnish manufactured in India with Fluor Protector and Bifluorid 12, the two commercially available fluoride varnishes which have to be imported from other countries and are cost prohibitive. The demineralization inhibitory effects and the antibacterial effects on Streptococcus mutans were studied (in vitro). Calcium and Phosphorus dissolutions were estimated as a measure of the demineralization inhibitory effect. Antibiotic sensitivity tests using the serial tube dilution method and disk diffusion method were used to evaluate the antibacterial effects of the fluoride varnishes. Of the three varnishes, Fluor Protector was seen to exhibit the highest demineralization inhibitory effect, while Fluoritop-SR was found to be comparable to Bifluorid 12 in its caries protective effects. Chondroectodermal Dysplasia is a disease complex consisting of bilateral manual polydactyly, chondrodysplasia of long bones resulting in acromelic dwarfism, hydroitic ectodermal dysplasia affecting principally the nails, teeth and hair and congenital heart malformations. It is necessary to identify this disease at its early stage in order to render prompt treatment. The oral manifestations are characteristic for this particular disease so that a dental surgeon can identify this condition and refer the case to a cardiologist and orthopedician for corrective surgeries. In this article, a case of a 2 1/2-year old child with chondro-ectodermal dysplasia is presented along with radiographic investigations and treatment plan. The present pilot study was conducted on five primary mandibular second molars requiring endodontic treatment to evaluate the clinical and radiographic success of root canal filling material which was a mixture of calcium hydroxide paste (1 cm), Zinc oxide powder (15 gms) and distilled water using hand operated lentulo spirals. All the five cases on clinical evaluation after 2,4,6,9, and 12 months were found to be asymptomatic with no history of pain, tenderness or abnormal mobility. Immediate post-operative radiographic evaluation revealed adequate root canal filling in all cases. The obturated material remained upto the apex of root canals till the beginning of physiologic root resorption. The roots of the primary teeth as well as the filling material mentioned above were seen to resorb at the same rate in one case. A case of natal and neonatal teeth in a 25 days old infant and its management is reported. 2,007 children from 11 schools, selected through stratified random sampling were examined for dental caries and oral hygiene status. The Mean DMFT was found to be 2.85 and 3.40, mean DMFS 3.76 and 4.56 in 13 and 14 year olds, respectively. Females recorded higher mean values of DMFT (3.37) than males (2.94). There was no significant difference in the mean values of OHI (S). The overall prevalence of dental caries was found to be higher among 14-year-old children compared to 13 year children. The purpose of this study was to compare the clinical efficacy of resin modified GIC with amalgam as a restorative material, in Class-II cavities of primary molars. Restorations were evaluated at four, eight, and twelve months for their marginal integrity, anatomic form and development of recurrent caries. When each parameter was considered separately, there was no difference in the success rate between the two groups, except development of recurrent caries significantly less (p<0.05) in RMGIC group(4.7%) compared to amalgam group (12.5%) at twelve month follow up. However, the cumulative success rate at 12 month was found to be significantly higher (p<0.05) in RMGIC (Fuji II LC) group(83.1%) compared to amalgam(72%). Presented here is a case report of a 5 year old boy with a dentigerous cyst in the left maxillary canine region associated with cortical expansion and facial asymmetry. Dentigerous cysts are not common at such an early age and are also relatively less common in the maxilla. The management comprised of enucleation and follow up for 6 months.